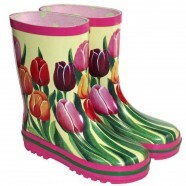 Trendy and colorful Tulip Boots for typical Dutch weather conditions. Tulip Boots are ideal for gardening and/or hiking with the kids. Available for both kids and adults (shoe sizes EU 23-39).